First off, you will probably love this recipe. Just had to get that out of the way. Second, I had to make this recipe twice. Because the first time I had to troubleshoot a bit. The Instant Pot is a little tricky to understand at first (at least for me it was), but now that I’m getting the hang of it, I’m loving it. Note: I am using the 6 quart Instant Pot for my recipes, not the big 9 quart one and not the mini (3 quart). On my first round of trying this recipe, I kept getting a “burn” message on the front of the pot and I thought, “well that can’t be good”. So, I did some Googling and discovered that when the Instant Pot says that, it means the heating mechanism is overloaded and not distributing heat evenly, therefore it just shuts off. The culprit in this case? Too many meatballs in the sauce and more importantly, AT THE BOTTOM OF THE POT – they weren’t letting the moisture get through. PRO TIP: You need enough liquid in the Instant Pot to cook properly with it and create a means for steam. You’ll find a lot of Instant Pot recipes tell you to not mix the wet ingredients into the food until it’s done cooking. Just plop them right on top and cover the pot to pressure-cook. i.e. if you’re making chili, put ground beef in, then just pour any sauces and seasonings over the top and DON’T MIX til it’s done cooking. Seems weird, but it’s a necessary step you need to train yourself to do when using an Instant Pot. Now, back to the recipe. I loved how quickly the Instant Pot cooked the spaghetti squash, and I thought the meatballs came out perfectly soft and flavorful. But that could be because I make great turkey meatballs. My few “secrets” are the ketchup and the white bread. Could I sound MORE American right now? I know, but trust me, the ketchup adds sweetness, and the wet crumbled white bread is an old trick my Safta taught me, and has been a known practice of many Nonnas around Italy too. You wet the white bread with water (or milk some people suggest) so its soggy but not soaked, then you crumble it all over the ground meat and mix it in. Makes the meatballs more moist. The sauce gets a deep red color and gets flavored by the meat, so it ends up being like a “Sunday sauce”. It’s wonderful. My family approved too – so much so that they ate literally all of them when I wasn’t home. In a large bowl, add onion, garlic, ketchup, Worcestershire, salt, pepper, egg, and oregano and mix together. Then add the meat, the white bread, and breadcrumbs. Mix with your hands until well incorporated, just try not to over-mix. Wet hands slightly and form the meat into balls a little larger than a golf ball (I’d say two heaping tablespoons or so). I made roughly 15-16 meatballs. Set aside. In a separate non stick sauce pan, heat 1 tbsp olive oil over medium-high heat. Arrange meatballs in a single layer and let brown on all sides. They don’t need to be cooked through because they will continue to cook in the Instant Pot. Remove from pan and set aside. Turn on the Instant Pot. Prick the spaghetti squash all over with a fork and place in the Instant Pot. Pour over the can of crushed tomatoes and tomato-water, tomato paste, garlic, and salt. Don’t distribute anything evenly or mix. Add the meatballs to the sauce on either side of the spaghetti squash, and you can even pile them up on top of one another or the squash (they don’t all need to be IN the sauce, as this may be the cause for the “burn” error message). Set the Instant Pot to Pressure Cook on High for 15 minutes, close the lid and make sure the float valve is set to “seal”. When the time is up, let it naturally release for 5 minutes, then quick release the rest of the pressure. Remove the spaghetti squash carefully and let it cool off for a few minutes, then slice down the middle and scrape out all the seeds. Run a fork through the squash and it will automatically create strands. Add parmesan cheese to the sauce and the sprig of basil and let simmer in the pot for a few mins before serving. If you want to thicken the sauce more, you can set the Instant Pot to saute mode and let it bubble away for a few. 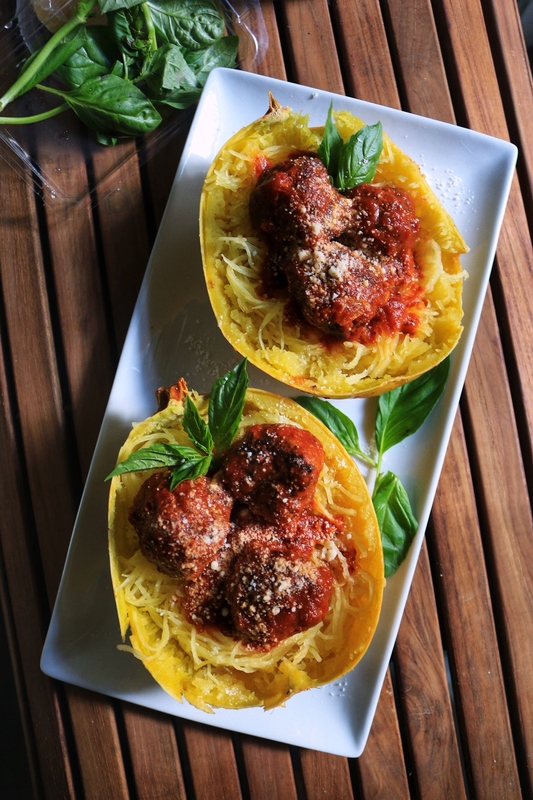 Serve meatballs and sauce over spaghetti squash and top with more grated parm and some basil. Enjoy! I tried spaghetti squash for the first time last week and I completely loved it. 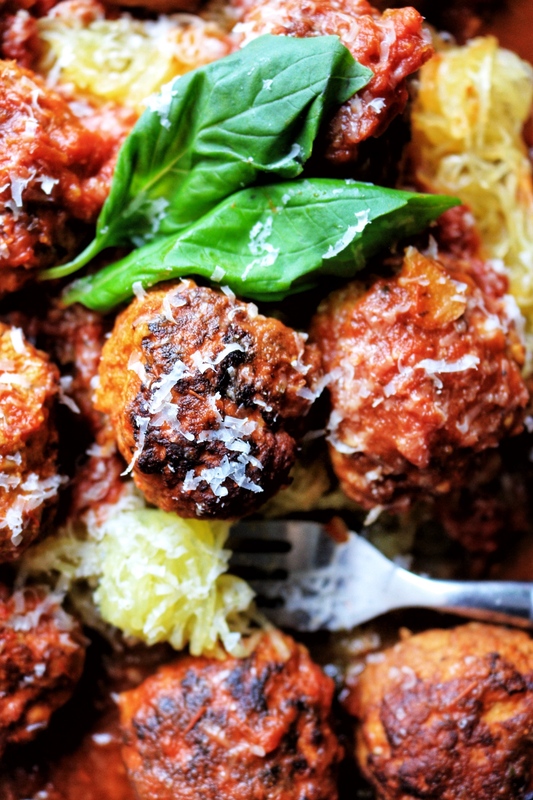 So I definitely have to try this recipe out, because I also love turkey meatballs. Yes!! Hope you like it! 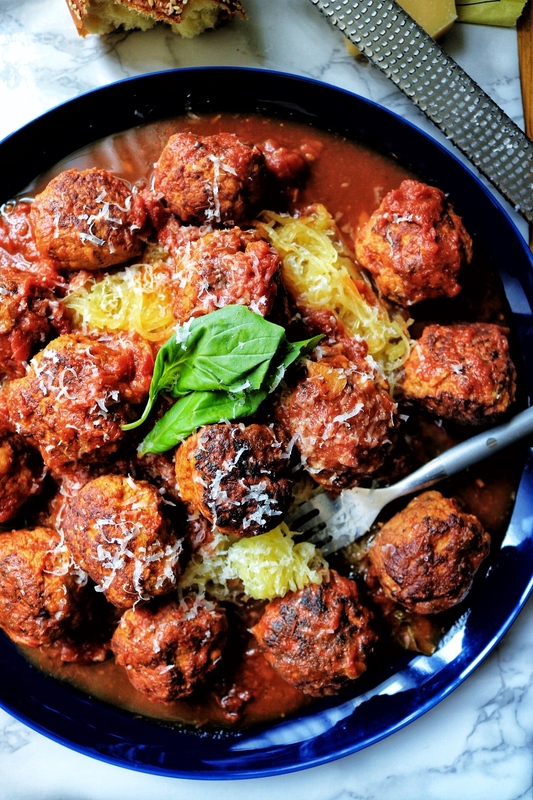 These are my favorite turkey meatballs to make. Tried this out the other day, and really enjoyed it, however I was a little confused by a couple of things. The ingredients call for Tomato Paste, but it’s not included in the directions. When is it meant to be added? Also, step 7 says to add some more Parmesan to the sauce, but none of the previous steps mentioned adding it, so is the “more” a mistake here, or was it missed in a previous step? Yes so sorry about that! I updated it. The “more” was a typo. Regardless, glad you enjoyed it!